Club Penguin Cheats by Mimo777 Club Penguin Cheats by Mimo777: Club Penguin Pin Cheat - BUCKLE BOOT Pin! Here is how to find the new Club Penguin Buckle Boot Pin cheat. Step 1. Go to The Night Club. Step 2. Now go to upstairs to the Dance Lounge. Step 3. Now click on the BUCKLE BOOT PIN! 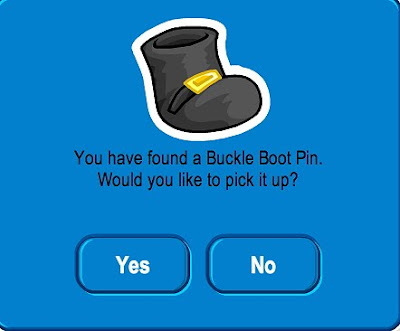 NOW YOU HAVE THE NEWEST CLUB PENGUIN PIN, BUCKLE BOOT PIN! But, wait! Wha? The old FEATHER PIN is still at the Beacon! AND the old WAGON PIN is still in the Ski Village! This is the first time EVER that there has been THREE pins out at once! What do you think is going on? Hey, did you notice the construction stuff in the Mine? How about that the missing puffles have returned to their spots? Pretty weird since we haven't even "rescued" them yet, huh? Have you noticed how each pin has a meaning to it? Like the wagon is for the orange puffle and the feather is for the puffle party, but what about the new pin? Well I think that the old boots are coming back as a non-member item for the puffle rescue event. If you mention this on your post please give me credit. Or maybe the boots have something to do with the St. Patrick's Day party. TOO MANY NEW POSTS! WHAT DO I MOD ON! LLOOLL!! You are right! I have noticed that too. I think the boots are for Rockhopper! I make them too! Screenhog probably drew that. Good point! Mimo may give you credit! GAHH three pins? What is going on!!! WHOA! Nice theory. Lol, that explains alot. Although, wouldnt the boots be for the St. Patricks day party? Maybe!! I hadn't thought about that! Race... Don't use Caps!! You are screaming in my ears!! I am deaf now!! - Boots Pin.. New Pin! That is the rundown! Hope I helped! the boots may have something to do with st. patricks day party? free item maybe? You have no artistic ability? You should see me working in Art with Clay. I am uncornaded. I cant even make a hallow circle. :[ So. I just squish it. My art is due tomarrow. oops. I reallt like this pin. I don't know why though! I love the new site updates.... looks like you are updating right now! Yeah I have noticed that... but a long time ago there was a pin and it was a hair brush. What does that have to do with anything? Nice theory though! Actually, the feather pin is for the Secrets of the Bamboo Forest play. Yes. Refrigerator. Cheese. Alphabet Soup. Random moment... LOL! I am not sure that he said that.. but he has all of these ties because he is awesome! Yep, there was a hairbrush pin. Also, don't use caps... you are hurting my ears.... Ow..
Yeah.. they are really cool.... watch out for updates on my site too... Mimo inspired me!! YEah! I voted for yours! Happy b-Day!! In case you haven't noticed, I am experimenting with my comment separators... Here are the finals..
Vote by leaving a response (Mod Response if you want.. = ) to this comment. I will use the one you pick!! Thanks! Ya, I know! Pretty cool how they put a lot of thought into it, don't you think? I think Mimo knows that too! Pretty weird, huh? It always has a meaning! Don't use caps! Yikes!? And, yes, since it is becoming nice outside, I am not on as much, but I try my best, and I have a lot to do! Especially if I am busy on Thursdays! Don't feel bad, Toys, I am not all that great, either! The reason the feather pin is still upi there is because of the Penguin Play "The Secrets of the Bamboo Forest." Without the pin people who don't have the pin can't cross the river to get the free background. But i have no idea about the wagon pin. I thought it would disappear by now. what happened to youe interview with Zoe? I think they are doing it so people can get a lot of pins and also if your new you can get it.They still have speical meanings.The feather for stage,the wagon for orange puffle, and last but not least the boots for rockhopper,lepercons,or speical puffle rescue boots. You've got a point there Bumper. What is going on? CP has never had these many pins out at once! Another weird thing (like the green and yellow puffles escaping from the mine insident). What's going on with CP? I wonder what they are up to.........? Hey! Did you know that the pin is getting smaller again? Award me!!! I dig the new banner at the top! it rocks!! 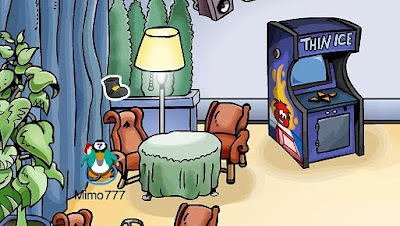 Hey everyone, if you want to meet me, Voilet 213 that is, on CP, go on at 8:00 PM at server Sleet at the town on Thursday, March 11. Tell me your from Blogger, and I will be your friend! See you guys there! Oh My Gosh! Three pins in a row! I wonder how Club Penguin can keep this up. Hey, have you people checked Mimo's new headings? It's cool! Hey nice! Mimo, i think the blue puffle in the pic is on an ice berg, it looks like one. And doesn't it look like Klutzy's claw holding the pic? or a penguin? (plz give me credit) thnx! I think you may be right, but isn't that the point of the pins? Anyway, the feather pin was for the play, not the puffle party. There is absolutely no proof that Screenhog did that. When you answer a question, please make it as honest as you can. Good theory! CP never puts out random pins,they are always related to something going on in club penguin. The boots are related to st patricks day. Its probably for the St Patrik's Day Party! Oh! Sorry, I thought you meant the pin. Mimo probably got a pro to draw that! Actually, it's the first time there have been four pins at once. You forgot to count Rockhopper's key in his journal. Yes - you have a good eye! I never noticed that. Maybe it's because Club Penguin got a lot of complaints that the pins were too big. Mimo should give you credit! I took a screenshot of the Pufferfish Pin (the pop-up that says, "Would you like to pick it up?") but I never got it. Yes, I never really think about how the pins could be related to something in Club Penguin, so well done for spotting!! This probably helped a lot of new penguins. And just one little thing: the feather pin is for the stage, not the puffle party, but that was just a minor mistake, don't worry about it!! That was a great post from you! hey mimo when I go to the ski lodge the wheelbarrow pin is still there... so weird! This is just a guess, but what if there is a pirate party coming soon. Maybe the boots are for that. 3. Buckle Boot Pin For Maybe New Boots coming out! have you noticed that on the newspaper it says that the pins will no longer be there until march 10! its past march 10! Have you noticed that in the mine when you click on the hole the puffle doesn't come out anymore!! Me too, the boots were a really old item. When will the ST Patricks Party be..St Patricks Day is on the 17th and parties usually come out on a Friday,well Thursday now that it launches early. And yet CP has said nothing about the party...It better be happening this year..we were all livid with anger that there was no water party last year! The boots were here a couple years ago! they are for St. Patrick's Day! i got them some long time ago at St. P's Day Party once! This is the best cheat site EVER! The feather pin is still there because in the play (the secrets of the bamboo forest)you need that pin to get the secret back ground. Is there going to be a St Patricks day party??? And like before, SUPER COOL TEMPLATE!!!!!! Has anyone noticed that there are 2 pins out at the same tim ethe orange feather pin and moss key pin are both available to pick up!